Christian greetings in the precious Name of our Lord Jesus Christ; we extend an especial welcome to new subscribers and encourage every reader to follow the links and Scripture references. President Thomas Jefferson said, "A government big enough to give you everything you want, is strong enough to take everything you have." This is the objective of the spirit of Laodicea, better known as Communism, swallowing a people with no revelation of Jesus Christ, hence no hope in this world and no inheritance in the world that is to come. The forbidden truth is the ongoing economic crisis WAS planned: economic recovery is NOT planned. Elected "useful idiots" serving the "City of London" are spending their nations back to serfdom in servitude to banksters by borrowing credit created ex nihilo by a few keystrokes and click of a computer rat, or printing it into Edomite red. Lucifer, the god of phony "free trade" will have a human sacrifice to his totalitarian one world governmentnot the genocide of one nation or people but a global genocide by these political high priests of "NOVUS ORDO SECLORUM," unwilling to serve and save their electors, kith and kin by protecting the enterprise of their own nations. Please remember Pakistani Christians in prayer. Last Saturday eight Christians were burned to death as Muslims torched 50 houses is Gojra, a Christian colony in the Punjab, following false rumors of blasphemy. Our main article focuses upon the Millennium Temple; its Scriptures will be among those to which Brother Branham often referred. Since as members of the Royal Family you plan to move to the eternal land of the Millennium and the great hereafter, I trust you will be blessed. July 28, 2009  By bouncing sound waves off the floor of the Salton Sea, researchers have discovered more than a dozen previously unknown earthquake faults, leading to a new theory of how the ground is sinking and stretching near the infamous San Andreas Fault. . . Their data led them to propose that the crust in the area is being pulled apart by the San Andreas and nearby Imperial fault. When the crust pulls apart, it subsides and dips into a basin. . . Comment: The "shakeout" routine is identical to US safety precautions in the event of nuclear attack, and as effective. The only protection is identification with revelation of the present Truth, and the emergency is now, before the quake. Brother Branham prophesied: "And you don't know what time that this city [Los Angeles] one day is going to be laying out here in the bottom of this ocean (Choosing a Bride, p. 35:3). Is this really the Smoking Gun of Obama's Kenyan Birth? Now refresh your mind by reading the 1937 dreams of Joe Brandt. August 2, 2009  'WE'LL KNOW OUR DISINFORMATION PROGRAM IS COMPLETE WHEN EVERYTHING THE AMERICAN PUBLIC BELIEVES IS FALSE,' an observation by the late William Casey, Director of Central Intelligence at his first staff meeting in 1981. This observation reveals the mentality of cynicism which infests the US Federal control structures, and the reality that these structures regard the American people with total contempt. This attitude is the opposite to the noble concept of service to the American people which ought to inspire holders of public office, and therefore represents the epitome of decadence. . . The 'in-your-face' chutzpah and audacity of Bernanke's insolence here is breath-taking, in view of the facts that (a) the Federal Reserve System has been and remains deeply involved in both the perpetration and obfuscation of the Fraudulent Finance trading that has brought the world to the brink of catastrophe; (b) the current US Treasury Secretary, Timothy Geithner, when serving as President of the Federal Reserve Bank of New York, was a party to the illegal hijacking of the $4.5 trillion brought over from the People's Bank of China in May 2006 and then removed from Bank of America, Richmond, VA, to a Goldman Sachs account within Citibank under the sole signatory of his predecessor, the former CEO of Goldman Sachs, Henry M. Paulson Jr.; and (c) Bernanke is himself resisting Representative Ron Paul's bill, supported by 250 co-sponsors, for the privately-owned Federal Reserve System to be audited. . . . FACT: Although we could obtain no precise confirmation of this, the following added background information is pertinent. In the first place, the Bush Crime Family was reported to us by informed sources to be in 'desperate' need of finance to pay for the huge protective compound (bolt-hole) they are constructing in Paraguay, which these days is run by a corrupt, defrocked former Catholic bishop with 'a direct line' into the German-run Vatican and thus the Vatican Bank, directed by the former President of the Bundesbank, Dr. Hans Tietmeyer, who also serves as the Chairman of the Bank for International Settlements' Administrative Committee and is therefore the most powerful 'private' financial official in the world [see our report dated 26th July 2009]. . .
October 25, 2007  Nuclear industry eliminates depleted uranium wastes in ammunition on selected areas of our planet to reach a 500,000 total depopulation goal. . . We are facing a global mass extinction of 2-4 billion people, and a war against the genetic future of all species. Leuren Moret is an American independent scientist and international expert on radiation and public health issues . . . "The leadership in the US, the Congress, the White House, and the Pentagon has been taken over by a shadow governmentthat shadow from Wall Street and the city of London. The US is bankrupt and is being carved up like a turkey by the globalists. Europe is toothe EU is just another region being dragged into slaverylike the US-Canada-Mexico, which is now undergoing unification. I cannot believe this global nightmare being rolled out." Comment: "By Way of Deception They shalt make War" but neither the CIA or Mossad know anything of Christianity. Comment: Read Genesis 3:15 and watch this video of the Israeli navy attacking, boarding and hijacking the Spirit of Humanity in international waters on June 30, and decide for yourself if Israel has violated international and maritime laws. Israeli authorities confiscated most of the cameras and film from internationals documenting this attack. They missed one. . . The Israeli government also hijacks Palestinian fishing boats in Palestinian territorial waters, kidnaps the fishermen and sends it's military out to shoot to wound and kill them as they struggle to make a living. July 31, 2009  The case of the New Jersey rabbis who ran a Mafia-style syndicatewith a sideline in body partsis only part of a global criminal conspiracy to traffic in human body parts headquartered in Israel and financed by the Israeli National Health Plan. Israel is the world supermarket for body partsbut almost no Israelis are willing to donate. . . If you are an Israeli who wants somebody else's organs, you can enjoy a government financed "transplant tourism" vacation, group or individual. Pick Eastern Europe, Turkey, China, India, Pakistan, China, Central and South America, the Philippines etc. Choose from a line-up of donorslike selecting a live lobster to be boiled for dining pleasure. An Israeli "health" ministry directivecourtesy of the American taxpayer who is buried under the costs of health carereimburses Israelis who go abroad for transplants as much as $80,000. Dozens of New Jersey politicians, officials and prominent rabbis have been arrested in an FBI swoop on a Sopranos-style syndicate accused of bribery, corruption, money laundering and human organ trafficking. Three city mayors, two state politicians and a grand rabbi were among the 44 suspects arrested in one of the biggest crackdowns on organised white-collar crime. Were you traveling overseas or emigrating to another country, you would learn about its people, their history, culture and form of government, familiarise yourself with its economy, climate and geography; browse maps and photographs, acquaint yourself with statistics to assess its prospects and plan your itinerary. With this current intelligence you will prepare your documentation, arranging travel, accommodation, clothing, accoutrements and appointments in great anticipation. And as you are hoping to enter the eternal land of the millennium, won't you be more zealous to prepare and understand according to the present Truth as to what you should anticipate in the Kingdom of Israel when the theocracy is restored? Since the mystery of God is finished, we have to enquire in the Light of the present Truth what the Spirit of Christ, which enabled the prophets to see and prophesy His Kingdom in figures of the Old Testament kingdom, what He has announced and revealed to us by these shadows (I Peter 1:11-12). Hereby Ezekiel 4043 describes the Temple that is to be built for the Millennium, but we need to understand that this symbolical Temple of Ezekiel's visions, unlike the Temples of Solomon and Herod, will be "a building of God, a house not made with hands, eternal in the heavens" (II Corinthians 5:1) that will one day come down from God. The proper signification of this new Temple lies in the full revelation of the Lord God having entered His rest in His sanctuary, the Most Holy Place in the heart of His redeemed servant nation, Israel. Solomon's Temple first became the dwelling place of the Lord when the Ark of the Covenant was moved into it and the Lord manifest His Presence by the Shekinah (I Kings 1:8). But the Ark disappeared at the destruction of the Temple and was probably consumed by fire so that in Zerubbabel's restoration and the Temple of Herod the Holy of Holies was empty and the Shekinah did not appear to the high priest on the Day of Atonement. In Ezekiel 10:18  11:23 the prophet saw the Presence of the Lord depart from Solomon's Temple after He had prophesied the new birth of 144,000 Israelites twenty-six centuries into the future when the Lord will again be gracious to Israel and manifest His glory as formerly. Zechariah 6:9-13, "The Word of the Lord came to Zechariah: Heldai, Tobijah, and Jedaiah will bring gifts of silver and gold from the exiles in Babylon. The day they arrive from Babylon you are to meet them at the house of Josiah (the son of Zephaniah) where they will stay. Accept their gifts and make from them a crown and put it upon the head of Joshua (the son of Josedech) the high priest. Tell him, the Lord of hosts says: You represent the Man who will come, whose Name is "The BRANCH"and He will grow up in His place, and He shall build the Temple of the Lord. It is He who will build the Temple of the Lord. To Him belongs the royal title [Son of David] and He will rule upon His throne as King and as Priest with perfect harmony between the two offices." 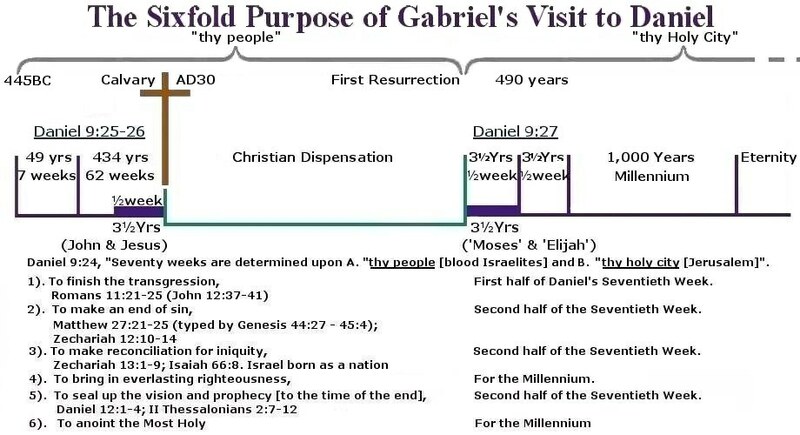 Around this time the Judeans were descrying Zerubbabel's restoration which, "in comparison with Solomon's Temple, is as nothing," whereupon the Lord delivered a compound prophecy in Haggai 2:5-9 (and later Malachi 3:1), "I promised when you left Egypt that My Spirit would remain among you. Fear ye not! For THUS SAITH THE LORD of hosts: In a little while I will begin to shake the heavens, and the earth, and the sea, and the dry landI will shake all nations, and [the Redeemer, Jesus Messiah], the Desire of all Gentiles [for Israel "desired Him not" (Isaiah 53:2-3; John 1:11)] shall come to this Temple, and I will fill this house with My glory, said the Lord of hosts. The silver is Mine, and the gold is Mine, says the Lord of hosts. The glory of this latter house shall be greater than of the former, says the Lord of hosts: and in this place will I give peace [between God and men through the Blood of the Cross (Genesis 49:10)], says the Lord of hosts". The shaking of nations implies judgments of wrath on the foes of God's people, including earthquakes that will sink Los Angeles and cleave the Mount of Olives before the reign of the Prince of peace (Isaiah 13:13). The kingdoms of the world are but the scaffolding for God's Spiritual Temple, and will be thrown down when their purpose is accomplished. In this mortal life someone has to design the engineering, grow and harvest the food, sew the clothing, build the houses and print the Bibles for God's people. The transitoriness of all that is earthly should lead men to seek "peace" in Messiah's eternal kingdom (Haggai 2:9; Hebrews 12:27-29). The Judahites hesitated in advancing the work of restoration through dread of the Medo-Persian world power, which was influenced by the craft of Samaria as today the Israelites are hindered by the craft of the Israelis"By Way of Deception Thou shalt make War." The prophet assures them Medo-Persia and all other world powers are to fall before Messiah, who is to be associated with this Temple; therefore they need fear nothing. Paul quotes this passage in Hebrews 12:26-27, comparing the heavier punishment which awaits the disobedient under the New Testament with that which met the establishment of the Old Testament when only earth was shaken (Exodus 19); now heaven and earth and all things are to be shaken (Daniel 2:35,44; Matthew 21:44), but Messiah's kingdom, "cannot be shaken." The elders were lamenting the absence of silver and gold that adorned Solomon's Temple, but the Lord wanted to adorn it with His glory which, veiled in the Son, outshone the outward adornment of gold and silver put on within and without by Herod. Jesus said, "In this place is One greater than the Temple" (Matthew 12:6). Those Temples of masonry were mere shadows and types of a Temple not made with hands, a holy house built of lively stones (Ephesians 2:21; I Peter 2:5). Zechariah 6:13-15, "He [The Branch] shall build the Temple of the Lord. It is He who will build the Temple of the Lord. To Him belongs the royal title [Son of David] and He shall sit and rule upon His throne as King and as Priest with perfect harmony between the two offices. (The repetition is emphatic. Despite His lowly origins "The Branch" will accomplish this great work of Temple-building and sit upon the throne. Then royalty and priesthood united in Himself will take such counsel as will result in salvation and peace for the Covenant people following our translation, for as well as us, "He was wounded and bruised for their sins, the punishment which procured their peace fell upon Him, and with His lashings they are healed"  Isaiah 53:5). "Then put the crown in the Temple of the Lord as a memorial in honour of Heldai, Tobijah, and Jedaiah. These three who have come from far away Babylon represent many others who will come from distant lands to build the [real] Temple of the Lord, and when this takes place you will know that my Message was THUS SAITH THE LORD. And this will come to pass, IF you will diligently obey the Voice of the Lord your God". Here we have a compound revelation referring to the calling of Israelites, but primarily Gentiles"all that are afar off"as "lively stones" for the building of the true Temple of the Lord in the final disposition of Grace in the Gentile dispensation between the dispensation of Law and the tribulation of Daniel's Seventieth Week (Acts 2:39; Ephesians 2:17). Zechariah 2:11, "At that time many [Gentile] nations will be converted to the Lord, and they too will be My people: and I will dwell in the midst of you, then you will know that the Lord of hosts has sent Me." And the racial supremacist attitude of Jewry, the vast majority of whom are non-Semitic impersonators, will have no bearing and the racial barriers between genuine Israelites and Gentiles of Adam's race, which were only temporary, will be "broken down," as they were when the Light of Zion illuminated the proselytes at Pentecost 2,000 years ago (Ephesians 2:13-22; Matthew 24:14; 28:19). Speaking with the New Jerusalem in prospect, Isaiah 60 declares, "Darkness black as night shall cover the earth and gross spiritual darkness the peoples, but the glory of the Lord in Jesus Messiah shall shine from old Jerusalem where He was crucified and is risen." Isaiah calls to the Israelites, "Lift up your eyes and see," then He beholds how this Light emanating from Jerusalem shines to the ends of the earth attracting Gentiles and their kings (Isaiah 49:6), and portrays the future triumph of the Gospel as caravans and ships bear Christians as living stones in the Temple and gather others with silver and gold and precious gifts, so that the chief upholders of evangelism today are those nations most distant from Israel, and farthest also from the apostate once Christian nations. It is almost time for the Lord to end the Gentile dispensation and return to Israel and address the compound revelation of Zechariah 6:15: "If they will diligently obey the Voice of the Lord," and "when they are truly ashamed of their iniquities, He will show them" (Ezekiel 43:11) through the ministry of the Hebrew prophets of Zechariah 4 and Revelation 11 the plan for the sanctuary of the Lord's house, which is "a habitation of God through the Spirit"Christ, the mystery of God revealed in human flesh. Only then will they recognize His glory over Zion in the Shekinah that is to rise over the mount of Olives east of old Jerusalem (Zechariah 14:4-9; Matthew 24:30-31; Acts 1:11; Revelation 1:7; 7:2; 18:1). Ezekiel 43:1-2, "After the measuring of the Temple the Lord brought Ezekiel to the gate looking toward the east so that he may see the glory of the God of Israel coming from the east to its rest in the Millennium Temple. The sound of His Coming was like a noise of many watersthe multitudes of those who are already lively stones in the Temple shouting glory to God (Isaiah 6:3; Ezekiel 1:24; Revelation 1:15; 14:2; 19:6): and the earth shone with His glory," for since the Gentile dispensation has ended with the sinking of Los Angeles and the pouring out of the seventh angel's Vial (Isaiah 6:3; Revelation 15:8; 16:17) the Light of the Gospel has shone through the entire earth that was hitherto in Spiritual darkness (Matthew 24:14; Isaiah 6:3; Revelation 18:4). Revelation 19:1-4, "At the beginning of the second half of Daniel's Seventieth Week when the 144,000 elect Israelites are new-born, I . . . . . (insert your name here as throughout this Book John represents Christ's end-time Bride) . . . . . heard the loud rejoicing of a great crowd in heaven, saying in Hebrew: "Alleluia! Salvation, and glory, and honour, and power, belong to the Lord our God: for His judgments [of the Seven Trumpets, Seven Vials, Three Woes, the sinking of Hollywood and the atomic annihilation of Vatican City State] are true and just. For He has judged the great harlot who corrupted the earth with her fornication [or idolatry], and has avenged the blood of His servants at her hand." And again they said, "Alleluia! Rome's smoke goes up forever and ever." Then the twenty-four elders and the four living creatures fell down and worshipped God who is seated upon the throne, saying, "Amen! Alleluia!" Ezekiel 43:3 portrayed this restoration of the theocracy in figures under the Law that would be familiar to his people, "The appearance of the glory of the Lord was as I had seen in the vision of the Lord's departure from the Temple when I prophesied the destruction of the city, subsequently destroyed by Nebuchadnezzar, and like the vision I had seen by the river Chebar; and I fell upon my face". "Son of man, this is the place of My throne, and My footstool, where I will dwell in the midst of the children of Israel forever. The house of Israel shall no more defile My holy Name, neither they nor their kings by their idolatry or by the memorials to their wicked kings" (Ezekiel 43:7). As heaven and earth were not "finished" until God "rested" on the seventh day (Genesis 2:1), so the Millennium Temple cannot be finished, although the measurements are complete, until the Lord has taken residence by entering into His rest in the 144,000 elect Israelites "forever" (Ezekiel 43:7, 9; 37:26, 28). Neither in the Tabernacle nor in the Temple did the Lord place His throne, the Ark of the Covenant "forever," for the Ark was a shadow of an eternal reality to come. "The place of My throne" was once the Ark of the Covenant that represented heaven because "heaven is My throne . . . [where] God dwells between the cherubim" (Isaiah 37:16; 66:1; Exodus 25:22). "And the earth is My footstool: what Temple can you build Me in comparison to that? And where is the place of My rest?" So the part of earth on which the Ark, or "heaven" stands in the Temple is the Most Holy place. But the Ark was "made flesh, and dwelt among us, (and we beheld His glory, the glory as of the only begotten of the Father), full of grace and truth" (John 1:14). Brother Branham said, "Notice, the Tabernacle of God will be with men . . . the former things has passed away. This thing has passed away. This means that heaven has come down to resident with man. See? Heaven and earth are embraced. Just exactly, when the Dove came upon part of the earth, which was Jesus. He was the dust of the earth: man. God coming from that one little life germ by creative power, and the Life that was in that Blood ascended back to God, but the Blood dripped upon the earth to claim it" (The Future Home of the Heavenly Bridegroom and the Earthly Bride, p. 54:444-445). Thus when the antitype of the Ark, which is Christ, together with His Bride, for through the invisible marriage union the two are one, enters into the heart of the 144,000 elect Israelites who are part of this earth upon which the Blood of Christ fell to sanctify, and the sanctuary of their heart becomes the Most Holy Place (or Holy of Holies) where the Lord God of Abraham, Isaac and Jacob will dwell forever (Exodus 26:34; II Chronicles 5:7). Whereas the Devil wishes to live in your head by memory, conscience, reasoning, imagination and affection, God wants to dwell in the human heart by faith. Thus the Holy Spirit has sovereignty in and over the soul of His elect. In Israel under the Law, God entered and anointed the sanctuary as His dwelling and the focal point of national worship. What a dwelling is in a larger sense and generally, the Ark of the Covenant is in a narrower sense and in particular; in it the dwelling of Jehovah is concentrated in a single point as it is in your heart, and in Jesus Messiah. In the new heavens and new earth the Most Holy Place will be the New Jerusalem overshadowed by the Shekinah (Revelation 21:21-24). Christ's Bride is the New Jerusalem that will descend from God out of heaven, prepared as a bride adorned for her husband, and the anointing will be upon them as the focal point of universal worship, for all God was He poured into Christ, and all Christ is He has poured into His Church (John 17:21-23; Ephesians 1:22-23; 4:13). And the 144,000 elect Israelites will be our personal servants.